A designer's dream come true!🦄 We are thrilled to officially announce the newest addition to the Prott family, Prott for Mac! 🙌 Created for designers in mind to give them a faster and smoother experience in getting prototypes out the door. Staying true to the concept of rapidly prototyping, with an intuitive and sleek UI, you'll be able to swiftly upload screen images, link screens, and add transitions in a breeze. 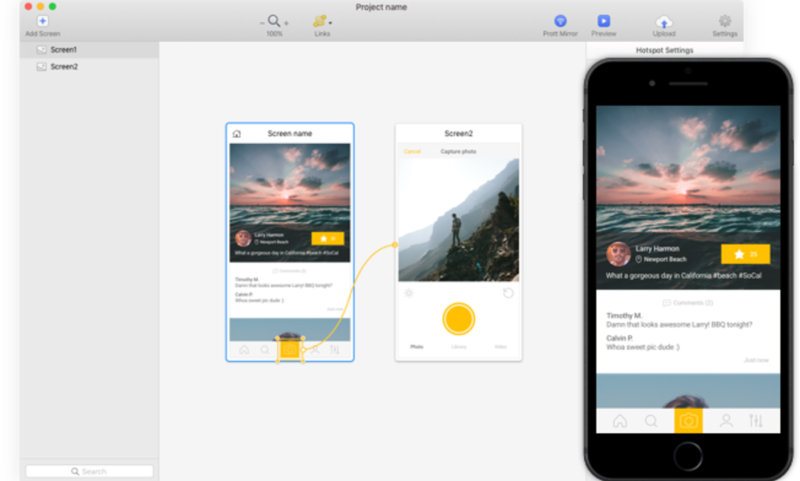 Not only will you be able to design your prototypes at an accelerated pace, you'll also be able to sync any designs made in Sketch to the Mac app easily with just a few simple clicks. Just like how Batman has his sidekick, Robin, the Mac app has one too. 😏 Install the Prott Mirror app to your iOS device and once you've finished creating your prototype, connect your iOS device to the same Wi-Fi network as your Mac to begin previewing your prototype in real time. We understand the importance of being able to disconnect from the world to focus on creating your designs. We've therefore made it possible to work offline in the Mac app, meaning easy access, anytime, anywhere. You must be wondering, "What do I do after I'm done creating my prototype in the Mac app? How do I go about sharing it with others?" Not to worry. Simply click the upload button in the Mac app to select which Prott for Web account to upload your project to. Once it's been uploaded, share your work with others and get the feedback you need. Ideate your designs rapidly in Prott for Mac*, preview your work with the Prott for Mirror and collaborate with your team members using Prott for Web. 😉 To download the latest Sketch plugin, get it here. *Prott for Mac is available exclusively to Pro, Team, and Enterprise plan users as well as users who are on the 30-day Pro trial. If reading about Prott for Mac got you interested, upgrade your plan by logging into your Prott for Web account, head to settings (under your profile icon on the upper right corner), and click on Upgrade. - Projects created in Prott for Web as well as Prott for iOS are not synced to Prott for Mac. If there's a project already on the Web that you'd like to try out on the Mac app, download your screens and upload it to the Mac app to start linking screens and adding transitions. Note: An internal business decision was made to shut down Prott for Mac on Wednesday, January 31st, 2018. But just because it's closed doesn't mean it's goodbye. We hope to incorporate the aspects that you liked about the Mac app into other Prott platforms so stay tuned for Prott 2!